Bartenders from 10 neighborhood bars will concoct their takes on the drink that best reflects Wicker Park and Bucktown. BUCKTOWN — It's one thing to raise a toast to a neighborhood and another to drink it — literally. "If Bucktown and Wicker Park were a drink, what would it taste like?" is the question 10 local bartenders competing in the 2nd Annual Mixologist Mash-Up will answer Thursday. "It's like the Olympics of Mixology," said Adam Burck, executive director of the Wicker Park Bucktown Chamber of Commerce. Burck said he expects Thursday's event at the Dolphin, 2200 N. Ashland Ave., in Bucktown to be bigger than the first mashup, which drew 150 people to Wicker Park's Jackson Junge Gallery. "We have 10 bars instead of five like last year, and people can have tasty food and can get their picture taken in a photo booth," Burck said. 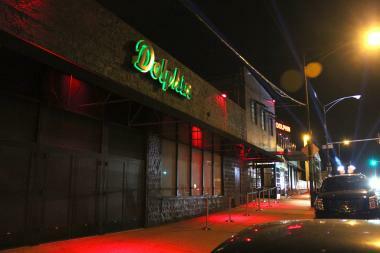 The Dolphin, 2200 N. Ashland Ave. will host the 2nd Annual Mixologist Mash-Up from 6 p.m. to 9 p.m. Thursday. While custom cocktails reflecting the essence of Bucktown and Wicker Park will be served to attendees who will determine the winner by vote, the evening also seeks to raise money for the chamber. Burck said the chamber uses proceeds from fundraisers like the mash-up to promote local businesses. At the inaugural mashup last March, defending champions Tom Kleiner and Lori Haarman from Club Lucky Italian restaurant created the 'Six Corner Fizz,' a take on a punch and a fizz. The Six Corner Fizz used ingredients representative of the neighborhood's Polish and Hispanic cultures and paid homage to the area's most popular intersection of Milwaukee, Damen and North avenues, Kleiner told the Chicago Pipeline blog. Kleiner is being top secret about what's in store for attendees Thursday. "We're putting a very large amount of thought into it, from everything from the ingredients to the glass it's served in, to the garnish, to the name," Kleiner said. Kleiner added: "Absolutely no hints, though [our drink] does have Absolut Vodka." Joining Kleiner and Haarman (who appeared on Fox Chicago Friday to hype the event) will be bartenders from Antique Taco, Dolphin, Fatpour Tap Works, Lottie's Pub, Prasino, Red Door Kitchen & Bar, The Boundary, The Savoy and Wicker Park Tavern. In addition to samples of each bar's concoction, tastings will be offered by sponsor Olmeca Altos Agave Tequila, and food will be provided courtesy of Red Clover Catering. 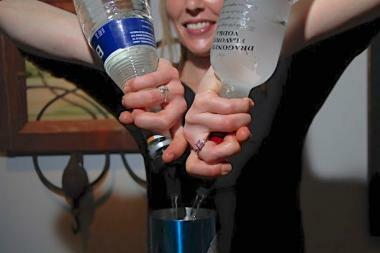 The Mixologist Mash-Up is 6-9 p.m. Thursday and limited to patrons 21 and older. Tickets are $40 online or $50 at the door.